If your opponent has any benched Pokemon, choose one and do 10 damage to it. Does 10 damage plus 10 more damage for each Energy attached to Politoed but not used to pay for this attack’s Energy cost. You can’t add more than 20 damage in this way. 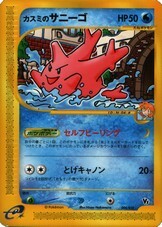 Once during your turn (before your attack), when you attach an Energy card to Corsola from your hand, you may remove 1 damage counter from it, if any. 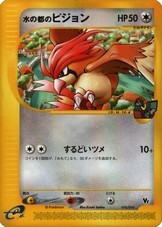 Does 10 damage plus 10 more damage times the number of Energy cards attached to the Defending Pokemon. Flip a coin. 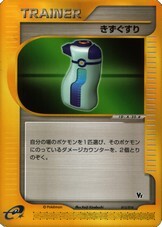 If heads, discard 1 Energy card attached to the Defending Pokemon. If you have any Water Capital Latios in play, all damage done to Water Capital Latias by attacks is reduced by 10. If you have any Water Capital Latias in play, whenever Water Capital Latios*s attack damages the Defending Pokemon, the attack does 10 more damage to the Defending Pokemon (after applying Weakness and Resistance). 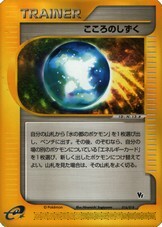 Search your deck for a basic Energy card, show it to your opponent, and put it into your hand. Shuffle your deck afterwards. Remove 2 damage counters from 1 of your Pokemon (1 if it has only 1). 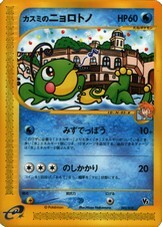 Search your deck for a Pokemon with Water Capital in its name and put it onto your Bench. Shuffle your deck afterward. 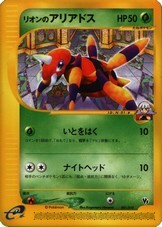 Then, if you have any other Pokemon in play with Energy cards attached to it, you may take 1 of those Energy cards and attach it to the new Pokemon. 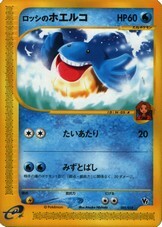 Attach this card to 1 of your Pokemon in play with Water Capital in its name. 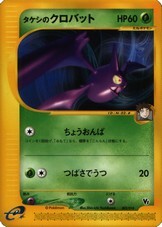 That Pokemon may use this card’s attack instead of its own. At the end of your turn, discard Altomare Cube. 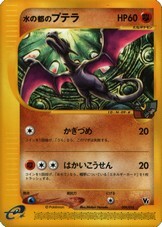 Just as if the trouble caused by Oakley wasn’t enough, Aerodactyl managed to spot Latias and grabs it with its claws! Pikachu uses Thunderbolt to shock Aerodactyl, who then uses Hyper Beam on the boat! Latias manages to get Ash out of the water, then goes back on their boat, and the chase continues! Meanwhile, Misty and Brock release their Crobat, Politoed and Corsola and asks them to go help Ash while Brock climbs on the iron wires. Aerodactyl crashes on a building tue to its huge size, but then comes Kabutops, slashing multiple times, trying to hit Ash and Latias. Ash is knocked on the wall and when he’s about to get finished, Crobat tacles the fossil Pokemon while Corsola and Politoed uses water attacks to knock Kabutops into the water. Back in the museum, Oakley cackles as the city is under her control, while Latios is badly injured and gets hurt more as Oakley uses the machine’s powers. Then, she spots Ash on the water with Latias. 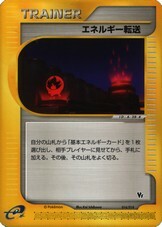 She decides to create a typhoon which spills tons of water, while Ash and Latias runs to the museum. But Oakley then create a barrier made of water, which then become a huge whirlpool, engulfing Ash and Latias! 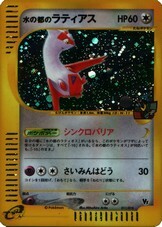 As Ash and Pikach are about to drown, Latias’ eyes glow blue and dispels the false water generated bu the machine. 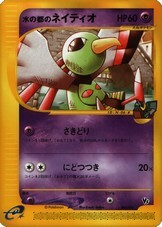 Then, in the Museum, it get haywire, locking Oakley inside and harming Latios even more than before! Fortunately, Ash manage to free Bianca and Lorenzo, who are determined to stop the machine before it’s too late. Latias find its companion with serious injuries, and as mush as Ash and Latias tackles the rings, it doesn’t do a thing. However, Latias managed to get hits head inside the rings, allowing the gang to pull off Latios out of there. 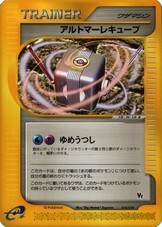 The two Eon Pokemon falls on the ground along with the rings…then the machine stops. The whole gang then gets reunited, while Annie checks out the Soul Dew ; it has a dark-purple like color. She touches it besides Lorenzo’s warning, get knocked into the machine as the Soul Dew explodes!!! The machine goes haywire again, and Lorenzo re-tells the prophecy ; if some with an evil heart uses the machine, the Soul Dew will die… along with the city itself! Water is getting away, leaving gondolas and boats on dry land. 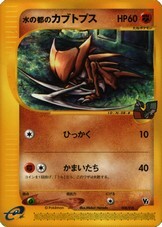 As soon as the thieves spots Latias in human guise, Annie send out her Espeon while Oakley sends out her Ariados. A String Shot and Psychic attack severely weakens Latias, when Ash pops up out of nowhere and orders his Pikachu to use Thunderbolt on the thieves. He then grabs the girl’s arm (unaware that the girl is Latias) and drags her away. 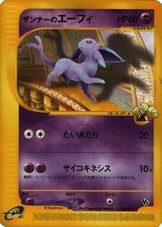 Meanwhile, Espeon and Ariados chases Ash, but manages to lose his sight. The girl flees, then Ash decides to go to the museum where Brock and Misty are. On the floor, they notices two fossils ; a Kabutops and an Aerodactyl. The museum guide then appears and tells a scary legend about the fossils ; long ago, a cruel Trainer used his fossil Pokemon to kill humans and Pokemon alike, until a Latios brought a tidal wave to the city, drowning the fossils and turning the streets into canals, giving birth to Altomare, meaning ‘high tide’ in Italian. There was also a huge machine in the middle of the museum, and the old man explains than this man-made machine was meant to protect the city in case of disasters. Ash then notices the girl from earlier, but with a beret. He accidentally touches the machine, which makes the old man somewhat nervous, and shouts to not to touch it. Ash apologizes, then gets out quickly. Later, he find the girl without the beret, and she happily beckons him to a wall in which she get past through. Ash tried to go, and ends in a beautiful garden full of Pokemon and water. The girl is swinging on a swing, while wind chimes starts spinning at high speed. An invisible silhouette gets out of the water and violently tackles Pikachu. Pikachu, ready to attack, gets weary, but when the silhouette attempts to strike for a second time, the girl get in its way, revealing itself to be Latios! Ash is astonished ; Latios really exists. 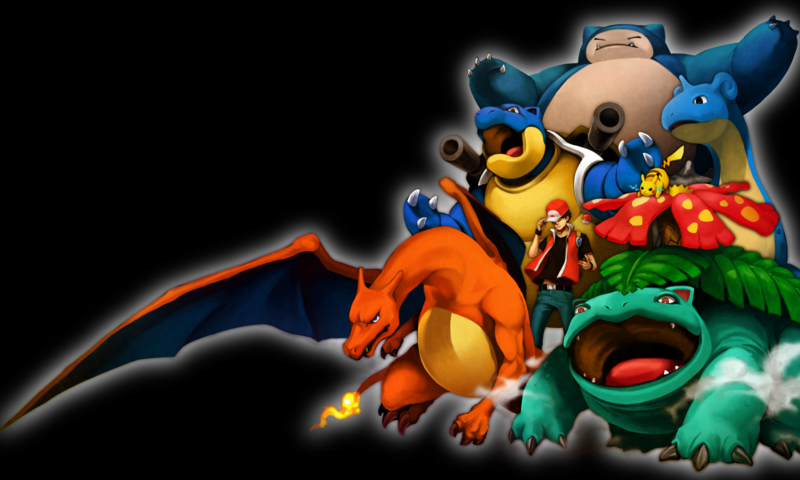 But, why is it mad at Ash and Pikachu? Then, another girl, very similar to the one who protected Ash, appears mad at him. Twins? Mistaking him for a thief, she asks him how he got in the secret garden, and Ash replies he followed the other girl. The beret girl orders Latios to attack, but is interrupted by the museum guide, telling her off because Ash wasn’t lying. The girl then tries to tell her grandfather something, but he tells her to be quiet, then asks Latias if she wanted to play with Ash. The beret-less girl takes Ash to the swing, then transforms into Latias! The old man, named Lorenzo, mentions that Latias might have a crush on Ash, while Latios appears behind Pikachu. Pikachu is still scared, but gets re-assured by a lick, then enjoys playing with Latias and Latios. 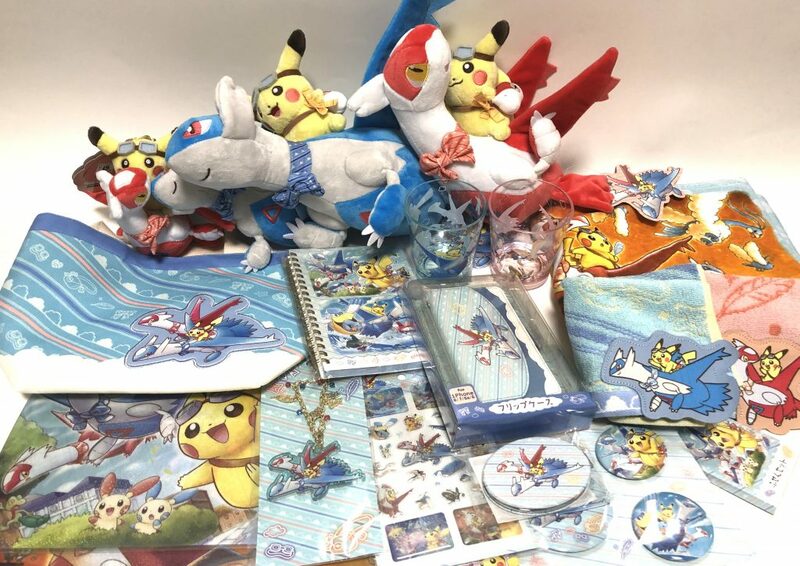 Pokemon deck boxes are one of the items merchandise many TCG players in the states love to have and to store their decks in. 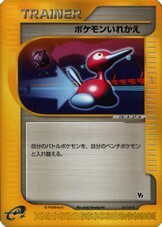 While in America the past years during the EX series line we got deck boxes for pre-releases but the boxes themselves were not up to the standards of the Japanese ones in the players view. The first few which were Gengar, Zangoose and Blastoise looked alright but after just a few uses some of them started to loose their stickiness on the cover and were very easy to break in the long run. The last deck box that America was suppose to get was the Latios and Latias one but due to the delay of shipment America never got them in time for the pre-release. Of course all deck boxes go through the wear and tear phrase depending how the player decides to keep them in. 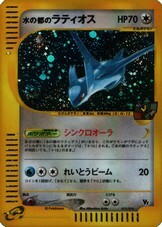 Latios is a dragon and psychic type legendary Pokemon, known as the Eon Pokemon, and known as Ratiosu in Japan. 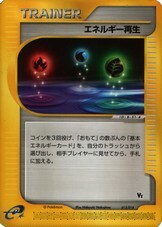 It has strong attacks like dragonbreath, luster purge, and psychic. It has a special power known as sight sharing, where Latias and anyone around her can see what Latios is seeing. Latios is always male, and is extremely fast. In the anime, in the Pokemon move 5, Ash befriends both Latias and Latios, helping Latias save Latios and Altomare from Annie and Oakley. They plan to use a machine that uses Latios and the Soul Dew’s power to power the machine, and controlling the town and even the world. In the end, Latios sacrifices itself to save the town, saying good-by to Latias, and becoming a Soul Dew.